Me Before You tells the story of the quirky Louisa Clark, who unfortunately lost her job and is seeking a new one. This is how she crosses paths with Will Traynor, who devastatingly became paralysed after a motorcycle accident. He no longer feels the joy of living and goes through each day doing nothing but taking his medication. When Louisa enters his life as his new carer, she brings a new light to his life and the book covers how their relationship develops. I fell in love with this book the moment I opened it and I couldn’t put it down until I was finished. 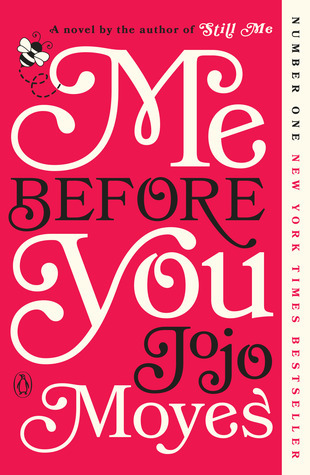 Jojo Moyes writes in a way that makes you feel connected to the characters and I got completely lost within her words. The story may be about a subject that only some understand but she makes you think about what would happen and how you’d feel in that type of situation. She addresses the topic of human nature and how connecting with certain people will make you see life in a happier way. Not only does the story contain romance but I see it as one that shows the hardships within the adult working life and how life can change at any moment. I feel like the moral is embrace life and live each day to its fullest. This novel is such a heart-wrenching story and is definitely one that you need tissues for. Although it had quite unique circumstances, everyone can sort of relate or at least compare to how they would feel. The characters are humanly flawed rather than solely being good or bad, which makes them much more likeable and realistic. Moyes writing flows easily but also gives a lot of detail which helps you put yourself into the story and relate towards how the characters feel and what they are experiencing. It’s mainly written in Louisa’s point of view, with some others when needed, which I think brings the reader closer to her character and makes it more emotional as she experiences the different parts of her journey. The story addresses many problems that most people would look over or not really imagine would be a problem, which I think brings a new light towards these circumstances. I went through every single emotion in this novel. It was a devastatingly beautiful and I have recommended it to so many people and would recommend it to anyone who loves a realistic romance but also just a beautiful story about humanity and the troubles of life.